“Independence means voluntary restraints and discipline, voluntary acceptance of the rule of law.” As India celebrates its momentous 72 Independence Day, the above words of Mahatma Gandhiji, the Father of the Nation, echoes in most minds. Seven decades down the line, from once being a humble nation, today India stands tall and high with scores of achievements to its credit. This is a time to reflect upon ourselves if we, as Indians have succeeded in grasping the real meaning of independence in letter and spirit. Have we been able to live upto the expectations which our valiant leaders had in their minds while fighting for the freedom of the nation? Questions prop us as India is all geared up for its most cherished day. India has beyond doubt taken giant strides and has progressed by leaps and bounds in spheres diverse. From being a nation that literally struggled to cope with its huge populace, soaring demands, abject poverty, hunger and innumerable social problems, today India has emerged as an economic power and a global leader. Today the whole world looks at India, astonished by the astounding progress it could achieve. The strength of India lies in its unity and diversity, in its vibrancy, its cultural splendour and its vast human resources. Today the nation’s tricolour is soaring high, thanks to its unprecedented progress which has been made possible by its men and women of great calibre and strength, who have proved their mettle in various spheres, bringing laurels both at the national and international levels. Today India has got the talent, the real talent that can bring positive changes in the world. Freedom or Independence is the breath of life and also that of a nation. For a vibrant nation like India, freedom is a challenge while also being a reason to celebrate. The multi-cultural ethnicity of India, it’s rapid strides in science and technology, the vast progress in Space Science and Information Technology fields and the giant leaps in education have proved the stepping stones of success of the nation. The Mahatma who laid down the path of peace and non-violence, Sardar Vallabha Bhai Patel, the steel man of India, Bal Gangadhar Tilak who gave a clarion call that ‘Freedom is my Birthright, Netaji Subhas Chandra Bose, the revolutionary leader, Bhagath Singh, Chandrashekhar Azad and many more like them were true patriots whose supreme sacrifice saw the birth of an independent India on August 15, 1947 thus freeing the nation from the shackles of colonial rulers. The formidable challenge posed by the British rulers was faced effectively by a great generation of supreme heroes who continue to be the inspiration of millions of Indians. India has stood the test of times. Every challenge that the nation faced has made it more stronger. It is a nation that has taken an unbeaten path, a path that will take it to greater heights no matter the turbulent times, the stress, the tension and unwelcome developments that have brought sufferings. The strength of this nation is so supreme that none can shake its secular fabric and the inherent virtues of patience, peace and tolerance which the nation nurtures and which form its rock solid foundation. India’s diversity is nourished with tolerance and patience. It is Peace, Co-operation and Friendship that bonds people. It was the self-respect, pride and the self-esteem of the nation that gave India it’s much needed freedom and it were these which the Constitution of the nation is striving to protect and help it in the march towards a great future. “Today India does not need rebels or revolutionaries, but a vast majority of people who can grasp the truth or the facts,” said a veteran thinker. A quick glance at the developments in the nation in the recent past makes this remark very meaningful. The nation’s ability to forge a strong national identity despite being a multi-lingual, multi-ethnic and multi-religious entity is yet another distinct hallmark. India’s democracy is vibrant mainly owing to the plurality of the nation and this diversity can be nourished only when there is patience and tolerance. No doubt vested interests will try to have their way and disrupt harmony and erode secularism, but it is patience and tolerance that eventually pays. Here the ideals of the Mahatma, of peace, harmony, non-violence, truth, human dignity and compassion comes to the picture. That India has adopted inclusive growth in every sphere and every developmental initiative has been the hallmark of this nation which always prides in its diversity that has stunned the whole world. India can be termed to have attained real independence when no one sleeps on a hungry stomach, when every child gets good education and every individual gets housing, healthcare and basic needs. When citizens joins hands with the government in these tasks instead of leaving it to the government alone, India can achieve progress much beyond the expected level. At every level, right from villages to metropolitan cities, people must come together and form groups to work for the disadvantaged sections of the society. It is only then that one can witness development in the true sense. Each and every effort, big or small can make a real difference. The late President’s words are thought provoking and very much relevant in the recent times when non-issues are turning out to be major issues in the nation. India takes pride in its democracy no matter the pressures and challenges that it faces. Here everyone’s opinion counts and everyone has to respect each other’s opinions and try to understand the view point of others. The combined hard work of Indians as well as the successive governments that ruled this largest democracy in the world, has helped India stand where it is today. If India is a force to reckon with, if India is a leader among the emerging economies and if the super powers of the world consider India a great partner of growth, it is all the net result of the unprecedented progress that the nation has registered since independence.Today, India has truly made its mark on the world stage and every Indian is proud of the nation’s achievement. 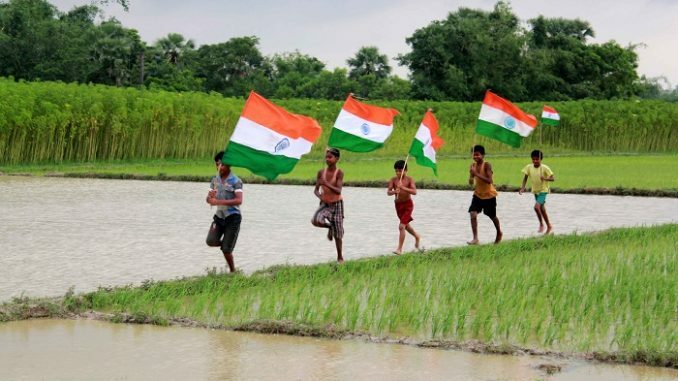 Independence Day is a time to introspect ourselves, our contributions to the nation as well as how far we have succeeded in protecting our hard earned freedom in the truest sense.